It’s one thing to watch high tides sitting on the beach, and another entirely while dining in an exquisite restaurant. The Marine Room, snuggled in the endless ocean waves of La Jolla, CA, offers seasonal brunch and dinner timed to the peak tide schedule. Award winning Master Chef of France, Bernard Guillas, is in the kitchen early with his culinary team preparing tantalizing dishes, such as an artisanal charcuterie, hickory smoked salmon and Grand Marnier chocolate brioche French toast for the breakfast buffet. When The Marine Room opened in 1941, it brought first class continental dining to San Diego; embracing a nautical, romantic atmosphere with seahorses as their appropriate emblem. The view and ambiance, along with the food, have made this a landmark restaurant with locals, especially for special occasions. Smartly designed on multiple levels, a sweeping view from the top landing and a wide staircase leading to the dining area offer a dramatic entrance. The hostess escorted guests to dining tables and elevated booths nicely arranged with white linens and classic tableware. Our waiter light heartedly explained he began working there many years ago to support his surfing activities during college, and now is a little grey at the temples and not surfing as much. During the lingering hours of the high tide breakfast, patrons casually walked around the large buffet table, and occasionally stopped to hold their filled plates to look out the windows at the waves. It’s common to see scuba divers and snorkeling enthusiasts in these waters, with strong swimmers catching the rolling surf. Who could resist riding these waves? Under the water are leopard sharks, stingrays, and of course, bunches of kelp. Nearly every dining table had a view with some in prime settings. People didn’t mind me peering over their shoulders (with camera at the ready) to capture the tide when it reached 6.9 feet. Waiters dressed in black suits did their best to serve hot coffee amongst the many photographers using all types of cameras, and gracefully moved in-between obstacles. Executive Chef Bernard Guillas grew up on the Brittany coast where fresh foods were gathered for meals, and the source was known. His future mission for cooking was based on this, and combined with experiencing other nearby cultures; it gave him an inspiring foundation. It’s his sense of what’s right when serving others in his established restaurants. Chef Guillas told me that he personally knows local sources for the most fresh and best ingredients, and often teaches cooking classes with these purveyors. A recent class was teaming with his seafood provider and demonstrating techniques for preparing sea bass and diver scallops. 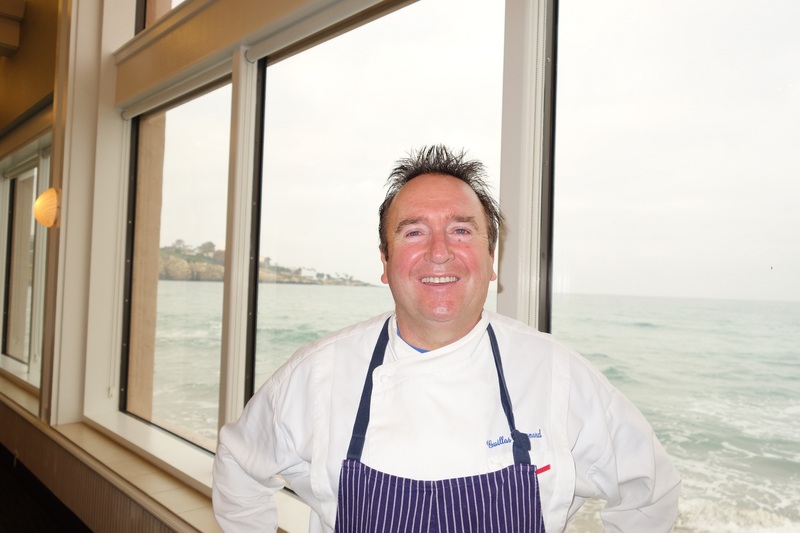 Neighboring La Jolla Beach and Tennis club has the same owner as The Marine Room, and Chef Guillas oversees those restaurants as well. Nearly a century ago, the Kellogg family realized the potential of this oceanfront property when La Jolla was a sleepy seaside town. The tennis club attracted professional players, and expanded over the years to include outdoor seaside and contemporary indoor restaurants. The attached California style hotel is a fun place to stay for a family vacation, exploring the beach, and dining without leaving the property. The Shores restaurant offers casual, yet sophisticated, dining on the edge of the flat sandy beach and ocean shore. 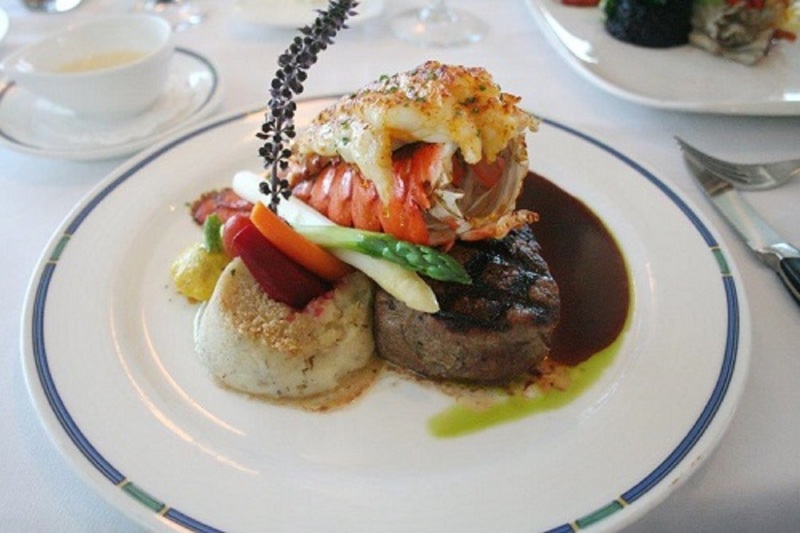 Themed dining events, such as lobster night, are offered at The Marine Room and Shores restaurants; and both are always popular for holidays and celebration events. Not many restaurants can boast about long time kitchen relationships such as Chef Guillas and Chef de Cuisine Ron Oliver, who have worked together since 1998. Part of their success is being passionate about traveling and delving into the world’s foods. 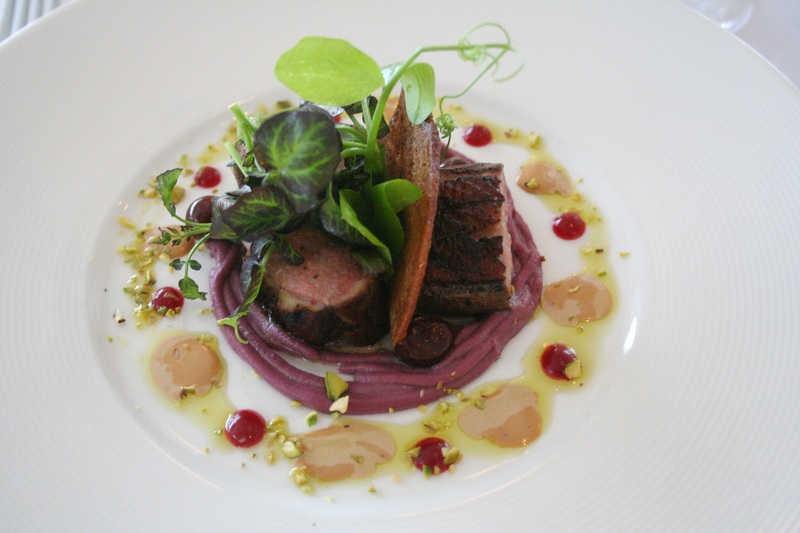 Combining their journeys and culinary expertise churns out unusual and stunning creations. The two chefs have written handsome cookbooks, and the latest book, Two Chefs, One Catch is about responsible fishing with intriguing recipes for fish from the Seven Seas. Numerous celebrity chefs endorsed the first book, Flying Pans, for its comprehensive tips, hints, and recipes for the home cook. High tide dinner, compared to breakfast time, is similar to enjoying a gondola ride in Venice; day and night offer varying atmospheres. Floodlights angled on the outside of the restaurant shine straight through evening water, exposing sea life. Evening kayakers paddled their way back to shore and seals bobbed around looking for dinner. Once night fell, a seal swiftly snatched a fish and consumed it for dinner. Toward nine o’clock in the evening, the seals routinely gather in this prime fishing area, and dunk in and out of the waves with fresh catches. The scenery is splendid day or night in this beautiful location, and San Diego Magazine recently voted The Marine Room the best place for fancy dining. Dinner offered tableside was Caesar salad, appetizer of tender duck breast and Armagnac reduction sauce, Humboldt Fog cheese Brulé with agridolc vinaigrette, and a main course of surf and turf; a juicy seared filet with fresh Maine lobster. My husband, a lover of all things rum, took one bite of the Malahat spiced rum baba and exclaimed it was the best dessert he ever had; while I nibbled on Kona coffee Pot de Crème and blackberry port ice. Between courses, I heard a vroom like noise and immediately saw a huge wave splash up the window. 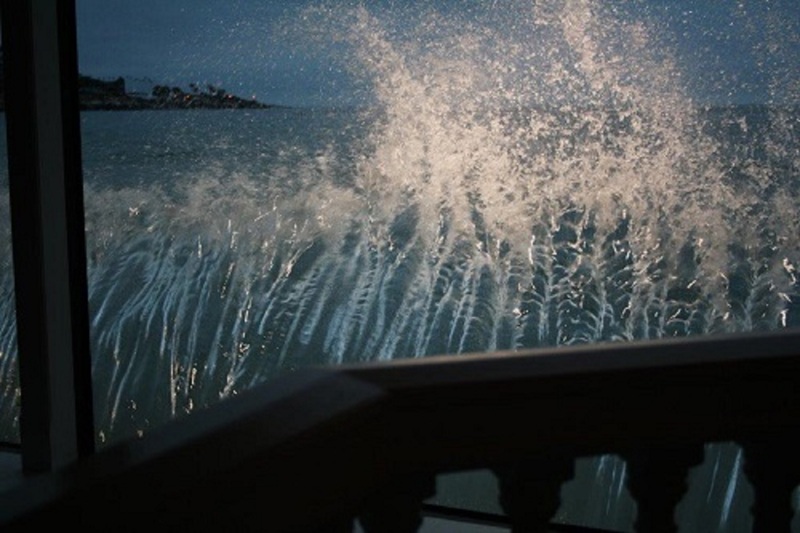 The waiter saw me jump a bit, and I was reminded that strong and reinforced windows were installed after the waves destroyed the dining room during a storm many years ago. I began to think another Luxardo Derby Manhattan might be in order. The restaurant website, www.Marineroom.com posts current menus and schedules of cooking classes, from beginner to master classes. A combination of the ocean with nature in action, and dining at The Marine Room, sums up Chef Guillas’s autographed cookbook, Life is Delicious. Combine rhubarb, sugar and lemon juice in large sauce pot. Stir. Cover. Refrigerate overnight. Place over medium heat. Add Chambord and cardamom. Cook until sugar dissolves, stirring occasionally. Bring to simmer. Cook until mixture thickens slightly, about minutes. Add strawberries. Return to simmer. Cook to compote consistency, stirring occasionally, about 10 minutes. Remove compote from heat. Fold in ginger. Cool completely. Transfer to serving dish. 1 chocolate brioche loaf, 14 oz. Wisk eggs, cream, almond extract, vanilla extract, orange juice, orange zest, cinnamon, salt and Grand Marnier in mixing bowl. Set aside. Slice brioche into 8 slices, about 1 inch thick. Dip brioche into cream mixture. Transfer to shallow baking dish large enough to hold bread slices in a single layer. Pour remaining cream mixture atop of brioche. Soak 10 minutes. Cook French toast in batches of two. Heat 2 tablespoons of butter (in sauté pan large enough to hold two brioche slices) over medium heat. When the butter starts to foam, add two brioche slices to pan. Cook two to three minutes on each side, until golden brown. Transfer the brioche toast to a sheet pan. Place in the oven to keep warm. Wipe the pan clean with a paper towel. Repeat process with remaining butter and brioche. Serve brioche French toast hot with rhubarb compote, and the star anise infused maple syrup. Dust with confectioners’ sugar. Disclosure: The author was a guest of The Marine Room, but expresses her own opinions.